We wrote our first impressions of the Lenovo N20p after a week and were happy with the way things were going. Another month later and not much has changed. We’re really happy with the Lenovo N20p Chromebook in the situations we were expecting it to perform. It’s NOT a PC, we’re not going to use when on a blogging tour and that was clear as we went through IFA in September and experienced a broken Windows laptop. The Chromebook was not a fallback due to media editing requirements and photo storage requirements. The latter task might be an option for someone at home connected with a stable, strong internet connection but when on the road and competing for bits on the press room hotspot, cloud uploads are not an option. Local storage wins, even for 0.5MB photos in that situation. Let’s step back and take a look at what we’ve got. 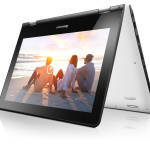 The Lenovo N20p runs a Baytrail-M SoC inside and it’s entry-level as far as PCs are concerned. The three most important elements of any laptop are the screen, keyboard and touchpad. Starting with the screen we can summarize as ‘weak.’ Colors are washed, viewing angles are poor and brightness isn’t very strong. Resolution is a basic 1368×768 which may not be enough for many users. If there’s one thing we could change on the N20P it would be to get an IPS screen. The Acer Switch 10 (Windows) proves it can be done at a low price. The Toshiba Chromebook 2 could tease buyers away from the N20p too. The keyboard is a mixed bag too but not as bad as it first appears. The low-travel keys sit in a keyboard tray that flexes in many places. Taking the keyboard out (it pops out of the tray easily) reveals two small strips of sticky tape that are responsible for keeping the keyboard tight again the backing metal. It doesn’t work well. Having said that this isn’t a keyboard that will slow you down much. After a week or so we were happy with speed and accuracy. It’s not very loud either. Compared to the thin keyboard on the Surface Pro 3 keyboard cover, this is better. We’re writing this review on the Lenovo N20p by the way! Note: We’ve added additional sticky tape under the keyboard now and it’s better. The touchpad is OK and does the job acceptably. Two finger scrolling, tap to click, two finger tap to right-click are supported. Three fingers can be used to switch between tabs by swiping. Two finger zoom doesn’t work although it’s supported on the multi-touch screen. The touchscreen works well. This reviewer has been working with touch-screens since 2006 and was pleasantly surprised to see how much support is built into Chrome OS. A long press brings up the right-click menu, text selection controls are built into Chrome, two finger zoom is smooth and the bottom taskbar can be hidden with a short swipe from the bottom. A swipe from the top when in full screen mode will cause the tab and URL bar to appear. A long press enables content to be drag and dropped. Let’s start the discussion at 180-degrees where the keyboard still works. Lie-flat mode is great for the lay-back crowd and it works well to bring the screen up to eye level on a seat-back tray or resting against a tablet stand. It’s a mode you’ll miss if you ever go back to a laptop that doesn’t have it. 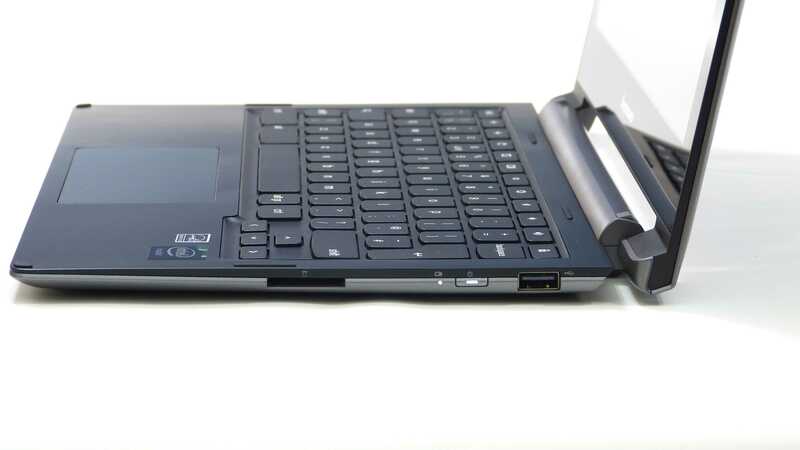 Beyond 180-degrees you’ve got a stand mode where the keyboard is disabled and where the touchscreen comes into its own. More touch features are enabled when the screen is folded back beyond 180 degrees including a volume slider and rotation lock control, on screen keyboard and task switcher. The keyboard is also locked (unusable) at just beyond the 180-degree point. The screen doesn’t fold all the way back for tablet-only operation so please don’t try forcing this! The Lenovo N20p we have here is built with an Intel Celeron N2830 which is a single core hyperthreading SoC running up to 2.41Ghz (nominal 2.16Ghz, minimum 500Mhz and we saw little evidence of it reaching 2.41 Ghz.) This 4.2W TDP part is able to run fanless. We suspect that the quad-core versions of these CPUs would require some better thermal engineering. (More space or a small fan.) 4GB RAM is ideal for multi-tab, multi app working especially as ‘apps’ like Google Plus and Google Music can take hundreds of MB of memory even when idle. With the 2GB version you’ll need to be careful not to leave too much running. Performance is acceptable for casual browsing, ChromeOS games and video playback (which uses hardware decoding) but there’s a noticeable difference between the N20p and something based on the Haswell-architecture. The Acer C720 is faster in all aspects. See below for benchmark test results. Some URL typing lag was noticed (as history matches are searched) and there’s more than a second delay when touching the Chrome apps launcher. Large Google docs can take a long time to load and the same applies to heavy websites. Video performance on a Chromebook depends on a number of factors. What video format are you playing and where are you playing it from? We tested a number of formats and found most working but there are notable exceptions. WMV files don’t work and surround-sound tracks are not decoded. (AC3, DTS.) In a test on the ASUS C200 we found that AC3 and DTS aren’t even passed through to the HDMI port. We weren’t able to test this on the N20p though. A Hi10p H.264 video also failed to play back but we doubt that many Chromebook owners will worry about this. H.264 with 2-channel audio is the best format to use and we were impressed to see 2K files being played back with no problem. In fact we ran up three simultaneous windows playbacks of the same 2K 24 FPS H.264 video file and still saw smooth operation. The combined bit-rate of 100Mbps tells us that this platform is well capable of flawless HD playback from local files. The YouTube story is different. Starting with a 1440p playback at around 8Mbps we saw a lot of stuttering and after a clean reboot and some waiting a 1080p YouTube video played back smoothly. We’re using ChromeOS stable channel V39.0.2125 here for our tests. We didn’t test Amazon Prime / Watchever. We understand that in some countries the Silverlight player is required for this but in the USA it should work in an HTML5 player. CPU, GPU and web browser performance. The performance of a Chromebook is primarily dependent on the Internet connection. As you start applications those applications may be coming from an internet source unless they have an offline component. The data within them will also come from an online source. During the use of an application data may be save into the cloud too and that could ‘block’ the application if internet is slow. Many applications use local storage to avoid this but clearly you must ensure that your Internet speed is as good as possible when using a Chromebook. The Lenovo N20p supports AC WiFi but we have used a USB Gigabit Ethernet adapter to connect for our benchmarking. Disk speed isn’t of less importance on a Chromebook than on a Windows PC apart from when copying local files (for example video files for offline viewing) but memory is extremely important. Swap memory is available (it’s a compressed in-memory swap space, not a disk-based swap space) but ideally you’ll keep your memory usage below the available RAM. 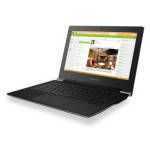 The 4GB on this Lenovo N20p is ideal for worry-free usage with many browser tabs open. At one point we had 14 tabs open with some heavy applications (Google Music, Google Plus) and we did notice some slowdown. Tabs can lose their cache if memory space gets low and returning to a tab in this state triggers a reload. As you can see the performance scores compete well against Baytrail Windows devices but can not match the performance of the Acer C720 Chromebook running the Celeron 2955U. Note that disk performance does play a role in the Peacekeeper test as the upgraded C720 with the MyDigitalSSD M.2 upgrade scored better. The Lenovo N20p offers AC WiFi support (not tested) along with 802.11n and older versions for backward compatibility. In our usual testing environment the WiFi was stable and quick to connect. Performance was comparable with a Microsoft Surface Pro 3 which, in turn, has medium-good WiFi performance. WiFi performance can vary wildly according to local conditions but the Lenovo N20p seems equipped to be able to offer more than can be expected for this price. 802.11ac provides some level of future-proofing. The Lenovo N20p is both fanless and uses solid state storage so it’s 100% silent. Heat isn’t an issue and even after running a battery load test we could only detect a small warm patch on the rear of the unit. The 34.8 Wh (Watt-hour capacity) battery is average in size and comparable to early ‘3-cell’ netbooks. Battery life, however is not comparable to those 2008 devices. We tested a number of scenarios and measured the average battery life using the chrome://power information. The results were good. Battery life ranges from 12.5 hours (local MP3 playback) to 6 hours video streaming but may drop further under gaming conditions. We ran Cracking Sands and saw an average of just under 9W so you can expect at least 3.5 hours of ChromeOS gaming on the Lenovo N20p. There are no energy management options in the current Chrome OS version used in this testing. Battery charging rate is good and a Lenovo N20p can be charged from 5% to 100% in approx 95 minutes. Paint quality is not good. Scratches easily. Other people often commenting on the looks and thinness. When you’ve had a silent laptop, you never want to go back. Micro HDMI port is a minus-point. Speakers are well positioned and loud enough for kitchen radio usage. Quality is reasonable with a well-round laptop-style sound. Stereo separation is good. Works with Bluetooth speakers (A2DP profile) and digital audio is also passed out of the HDMI port. Chromecast was tested with Netflix and YouTube. Memory and storage are both soldered onto the motherboard so there are no upgrade possibilities. An easel mode is possible but not recommended as the hinge is not stiff enough and there are no rubber stoppers on the tablet-touching edges meaning that it’s somewhat unstable. Other photos available in the Lenovo N20p gallery. Before you buy the Lenovo N20p Chromebook take a look at these Chromebook advantages and disadvantages and read the summary below. The Lenovo N20p has just reached $299 in the USA and along with the Lenovo Flex 10 (10-inch screen) it’s currently the cheapest convertible touchscreen laptop available. Is it cheap though? The N20p has traits of being built to a tight price for sure. 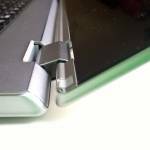 The paintwork can scratch, the keyboard on ours wasn’t stuck down properly and there are a few areas of the casing that feel cheap but after nearly 2 months our Lenovo N20P Chromebook has served well and become the go-to PC for this reviewer. It’s quick to start, stays charged for long periods and is fast enough, and productive enough for long periods of social networking, browsing and blogging. Silence is golden too because the fanless design is something that, once you’ve had it, you don’t want to lose it. Chromebooks are easy to reset, have a limited exposure to viruses or network attacks and if anything goes wrong can be ‘Power Washed’ in minutes without fear of losing content. The offline experience is good enough for writing, video watching and listening to music and if you prepare your apps (run them once before you try them offline) then you’ll have something to do while traveling. The fold-back screen isn’t a gimmick and helps in a surprising number of situations. 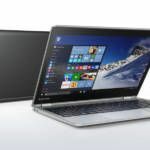 The touch capabilities, once you get used to them, are worth having in our opinion although if you’re not interested in that element of the N20p take a look at the laptop-only Lenovo N20 which will save you around $80. A micro HDMI is annoying but the main weak-point is the screen. With the N20p being able to run HD video files without problem it’s a shame that you have to watch them on a less-than-punchy screen. It’s that point that might have people looking towards the Toshiba Chromebook 2 B3340 which is a 13.3-inch Chromebook using the same Intel platform but it comes with a great Full HD IPS screen and 2GB RAM more than the Lenovo N20p. You’ll sacrifice the touch and convertible screen but we think that many are going to take that route. If you’re looking for an around-the-house Chromebook for social media and blogging, emails and YouTube then the N20p is fun, capable and recommended. 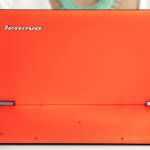 Find out more about the Lenovo N20P Chromebook in our database where you’ll find external reviews, images, specifications, alternatives and comments from our readers. Lenovo Yoga 3 11. Refined, again.